No, you did not miss an emergency alert for an incoming asteroid. All is well. 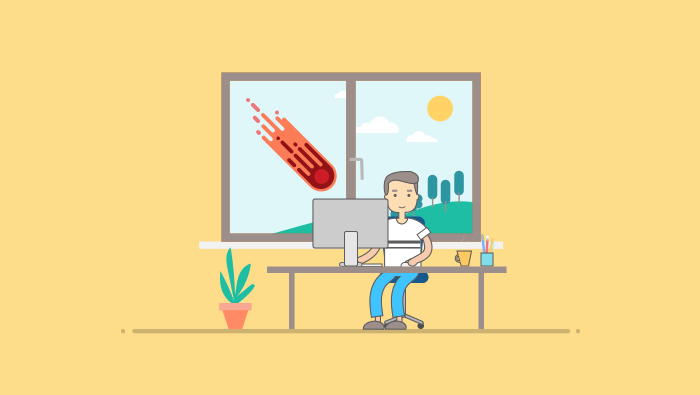 But just like the Emergency Alert System (EAS) and similar warning systems have to stay on top of a continuous flow of information, so does your business. Missing that important piece of insight from your team’s discussion thread won’t lead to flash floods and asteroid impacts. Nonetheless, you might feel the same level of frustration. And we all know that’s not how running a business should feel. Therefore, our designers have gone to the drawing board. We wanted to create a simple way to get notified about new comments on a discussion without the need to remember what’s the last thing you actually read. We want you to be able to catch up immediately without going through timestamps or holding the entire conversation history in your head. That’s not how ActiveCollab wants you to maintain your collaborative environment. We want you to inform yourself about the new updates much quicker, without investing any additional time and energy in figuring what’s going on. In a nutshell, you’ll be up to date with everything that’s going on, even better than before. Whenever you open a task, all new comments that appeared since your last visit will be highlighted. This way, you’ll immediately know which ones require your attention. Have in mind that if this is your first time on a task, no style will be applied. Once you focus on the comment form, the highlight will go away so it doesn’t distract you from delivering your input. Furthermore, if all new comments are not visible on the same page, the highlight will not disappear. It goes away only when you read the last unread comment. This is your chance to take a step closer to optimizing your workflow and making sure that every important bit of information catches your attention.